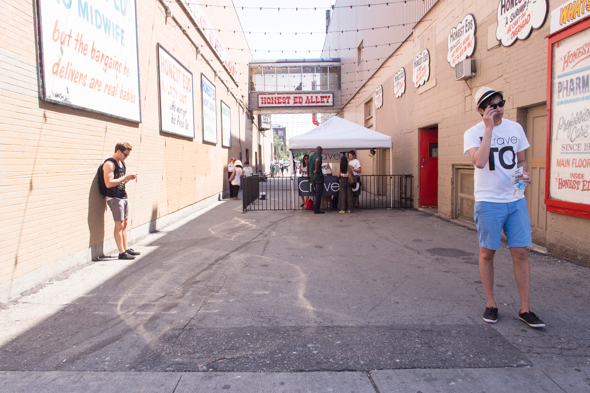 Almost three months after its first run, CraveTO popped up at Honest Ed's alley this Saturday with food, drinks and music for its second event of the year. 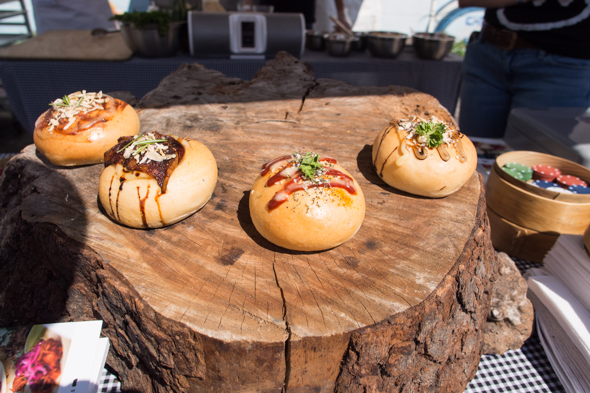 Featuring an almost entirely new line up of food vendors with influences from around the world, CraveTO divided the huge crowds from its first event into two smaller, more manageable day and night sessions. 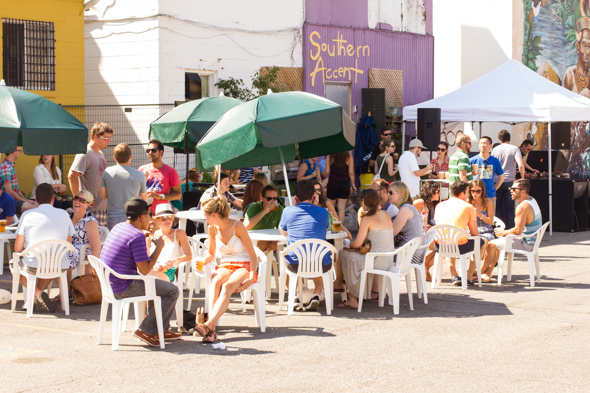 DJs ViVi Diamond, Rich Hope and e.steria provided tunes for the day, while Left Field Brewery, Hogtown Brewers, Kensington Brewing Company and Nickelbrook provided an assortment of ales, IPAs and fruit beers. If brewed drinks weren't your thing, Tromba and Iceberg were there with tequila and vodka options as well. Tromba's grapefruit margaritas were particularly refreshing. There were both food trucks and pop-up food stands, and the lineup included 14 different vendors. There were quite a few Asian and Asian-influenced dishes, including Kanto's Sisig fries, Gushi's Japanese chicken skewers, Eudora's samosas, and Hot Bunzz's Chinese style buns. Meat lovers got to choose between pulled pork, beef or bison short ribs fillings. Mango Pinto served up delicious arepas (Venezuelan flatbread sandwiches made from cornmeal) and their Pabellon option was a delightful spin off of the Venezuelan national dish, Pabellon criollo. 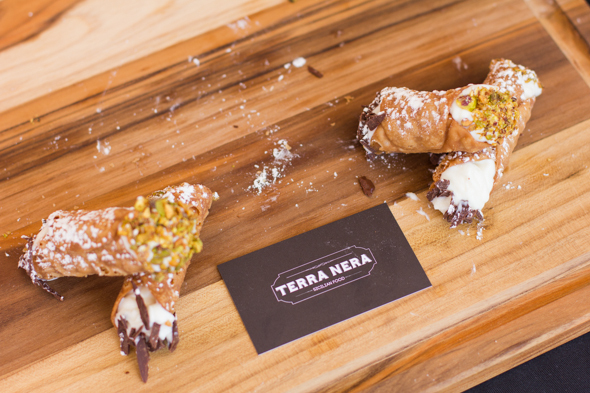 Pretty Sweet baked an assortment of cupcakes and Terra Nera had handmade Sicilian cannoli to satisfy the sweet tooth in the crowd. 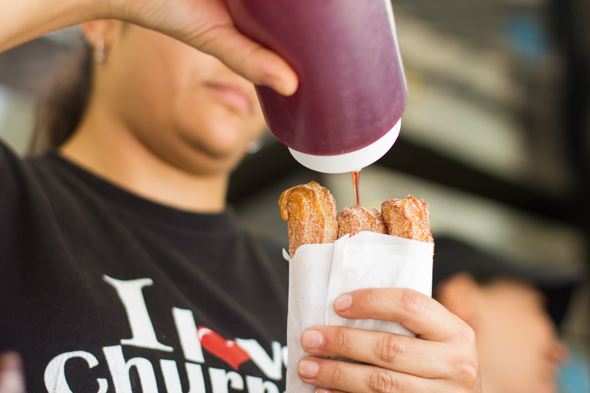 Fans of Pancho Bakery's churros will be excited to learn about their new food truck that debuted at CraveTO. The Dulce de Leche remains my favourite flavour, with strawberry coming a close second. Joining the fleet of food trucks were Fidel Gastro's signature sandwiches and Buster's Sea Cove's fresh seafood tacos. 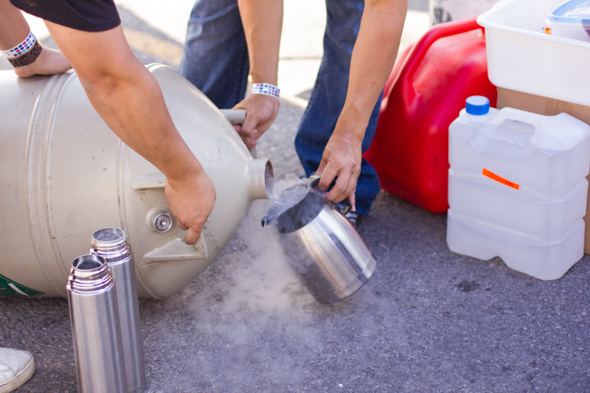 Ice Volcano drew quite a crowd by making liquid nitrogen ice cream. Their coffee ice cream was made exclusively for CraveTO and surprisingly smooth and creamy. CraveTO was more intimate and comfortable than the last, with shorter lines, and actual tables and seats to eat. While some vendors accepted credit cards, it's always easier and more efficient to have small denominations of cash handy. Organizers definitely took note of criticism from their last event and have clearly improved upon it. Check out more photos from the event in the CraveTO stream.